One Step Bee-yond! Suggs backs our Urban Beekeeping Project. 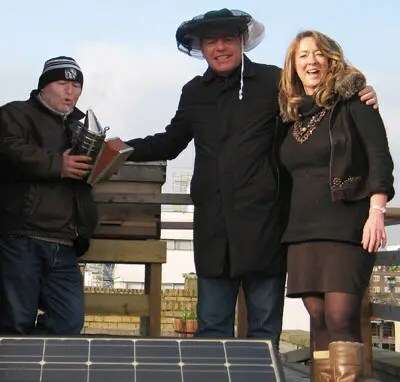 March 2011: Here at London Recording Studios, The Premises we’ve established a hive and a colony of bees on the roof and are now joining with other campaigns to encourage people to look after bees, particularly in urban areas. Madness lead singer Suggs (pictured right, with sax player Lee Thompson and Premises MD Julia Craik) has teamed up with us and we’re delighted to have his support. London has a seriously declining bee population, which has decreased by around a half since 2008. To help repopulate the capital we installed a hive on our roof a little while back and now, with the warmer weather and sunnier days arriving, the hive is coming out of its winter quiet and the bees are beginning their busy year. Suggs, who has been rehearsing with Madness at The Premises, has been interested in bees for many years and says “As experienced urban beekeepers my wife and I know how fascinating keeping these amazing creatures can be and how important it is to look after them in managed hives like the one at The Premises Studios. Beekeeping is a crucial part of looking after our environment so both the bees and our planet continue to thrive”. We have partnered up with a great organisation, The Golden Company, who work with local young people from diverse backgrounds, providing them with opportunities to learn sustainable business skills and take an active part in running the enterprise. One thing anyone with outside space can do to help the bees is to plant bee-friendly flowers; these include Chamomile, Sweet William, Foxgloves, Chives, Sage, Borage, Cornflowers and Dahlias. To many people’s surprise, urban honey is often far tastier than country honey. We planted a little garden up on the roof but the bees will fly up to 3 miles to collect nectar and the parks and gardens of city environments provide them with a huge variety of flowers resulting in more complex flavours in the honey. A little known fact is that bees sometimes communicate to each other through “quacks” which are always in G#. Julia says they hope to record this noise some time soon! /wp-content/uploads/2016/02/premises-studios_logo-white.png 0 0 Premises /wp-content/uploads/2016/02/premises-studios_logo-white.png Premises2011-03-03 17:01:022016-02-26 08:56:24One Step Bee-yond! Suggs backs our Urban Beekeeping Project. Bees quack?! This is the most awesome thing I have learnt all day. But the question is – Does a bee’s quack echo? Astonishingly educative cheers, I do believe your current followers would most likely want way more items such as this continue the excellent content. There is an amazing documentary about bees called queen of the sun http://www.queenofthesun.com/ i’m looking for people interested in the film so then we can buy the screening, they do small community screenings for 125 dollars for up to 50 people. i can’t wait to have a look at it.